There was a small sample at the very end of the scene-setting comic (to the humans it was advertised as a fireworks festival, but to youkai it was more like a challenge), showing off the format. Seems like they're playing off the popularity of the cross-reviews, but it should be pretty entertaining and more than just a Grimoire of Marisa II (even if it might not go as in-depth). Funny that it took ZUN so long to weave in the pretty obvious danmaku/fireworks analogy, but then again, pictures from Sumireko's Dreamland Adventure is indeed as fitting excuse as possible. Interesting how youmu, who lives as far as in the netherworld and being a half-undead, got invited as the judge while reisen, who lives much closer to gensoukyo and also a recent incident resolver, got ignored. Youmu doesn't strike me as an especially close friend to the protagonists. But since she's still half-human and the human protagonists do not seem get along with the the moon people along with reisen being full youkai, maybe it's more of a possibility that i thought it would be. If you read the manga Youmu is very commonly at parties and associates with Reimu and co. a ton. Reisen isn't particularly disliked, and Marisa runs into her here and there, but she doesn't really associate with them. It isn't because she's tied to the moon either, as she's basically become an earth rabbit in spirit. That being said, the real answer as to why it's Youmu and not Reisen is because Youmu is a funny dork while Reisen is uptight and thinks she's better than you. I'd imagine that ZUN (and the in-canon organizers of the show) wanted to have a team of human (human-ish, at least) characters as the judges. Probably to make sure the audience doesn't freak out, or something along those lines. Sorry, that joke/argument has been recently murdered by a tengu and an ice fairy. Next SCoOW coming out March, 4th. Spell Card FAQ and SC list by character? I wonder if ZUN finally answered some questions about how they actually work? 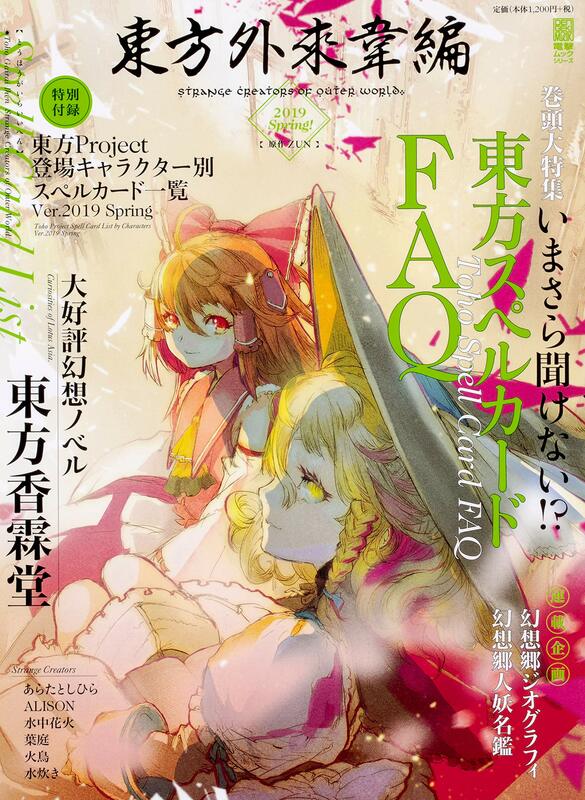 I mean, seeing how these magazines roll it's probably better not to expect much about it, because it will likely be just a summary about the rules or whatever, similar to how characters' profiles don't really add much to what we know except maybe ZUN's commentary, but one can always dream. I'd be happy to be wrong, though.